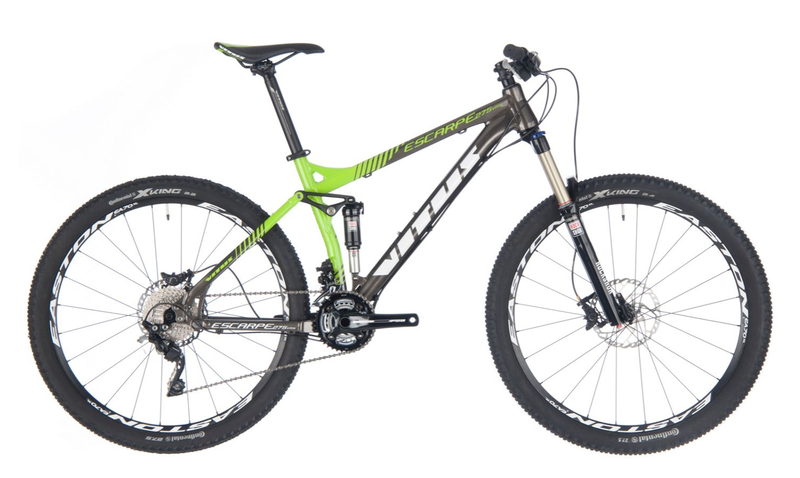 If we said you could get a hard hitting all-mountain rig that’s enduro-race ready for a penny under £1,600 you’d probably laugh at us, but that’s exactly what the Vitus Sommet 1 is. With a 160mm fork and an impressive parts package, this isn’t just another price-pointed trail bike that’s had its potential eroded due to lack of budget or focus. In fact, the parts package wouldn’t look out of place on a £3,000 bike. Okay, so a single-ring drivetrain with a distinct gravity bias to the geometry may not be everyone’s cup of tea, but the Vitus Sommet 1 is so capable and versatile that all but the most XC-focused racer will enjoy riding it. Yes, the MRP chain device is a little too delicate for our liking (we cracked it on the second ride), and even though the frame has a front mech mount and all of the associated cable guides, the chainset is single ring only — so if you want to fit a 2x drivetrain to increase the bike’s versatility further, it would involve a costly upgrade to the chainset. Still, we need to keep some perspective here; the Vitus Sommet 1 is a £1,600 bike, and the last time we checked, nothing even comes close in terms of value, performance or, more importantly, attitude. With the arrival of the new RockShox Pike, the Lyrik has been somewhat overshadowed, but it’s still a great performer. Sensitive, smooth and easy to set up, it really encourages you to push the Sommet to the limit. And with beefy 35mm upper tubes, oversized 20mm Maxle lowers and 160mm of travel, it’s solid enough to handle the nastiest of trails at home or abroad. The solitary 36t chainring means the Sommet is never going to win a hill climb challenge, but with the Monarch shock set to the firmest of the three compression settings, it doesn’t bob or squat under power. There’s also no pedal kickback through the drivetrain when you hit a bump, so grip is amazing on technical climbs. All in, the 150mm travel V-Link suspension is balanced and extremely capable. The stealth black Easton parts adorning the Vitus are seriously understated, and it wasn’t until we rubbed the dirt off the seatpost that we even noticed it was an Easton Haven unit to match the wheels and stubby 55mm stem. Subtle the graphics may be, but the lightweight, stiff wheelset, perfect stem length and decent-shaped 750mm Vitus handlebar made a massive difference to the bike’s handling. In fact, the Easton seatpost seems somewhat wasted, as it’s likely to be discarded in favour of the only upgrade the Vitus really needs — a dropper post. There was never any questioning the Sommet 1’s value for money, but it wasn’t until we ditched the conical headset spacer to get the handlebar low enough to weight the front end that its true character shone through. This bike is built for shredding. With a Maxxis Super Tacky tyre up front, cornering grip was off the scale and, combined with the stout Lyrik fork, picking a line and sticking to it was child’s play. In fact, it’s amazing how a good fork can make even the most tricky section seem effortless. The rear suspension was equally impressive, eating up everything we could throw at it with peerless aplomb and tons of braking traction too. But make no mistake, this bike isn’t just a ground hugger — far from it. The RockShox suspension has plenty of pop, so it’s super easy to get airborne on jumps or to simply preload the bike and bounce to the opposite side of the trail when you spot a better line. When we were back on the ground, the Vitus had us doing lots of skids too, so it’s a good thing that it came with a durable, harder compound rear tyre. Even at the original asking price of £2,399.99 the Vitus Sommet 1 was a steal. The geometry is dialled and every single component has been sweated over, so all you need to do is ride it as hard as you dare. Yes, you may need to run a smaller chainring up front, depending on your fitness and local terrain, but there are very few bikes, let alone £1,600 ones, that we’d happily pull straight out of the box and go race the Mega Avalanche on. We say this unreservedly — the Vitus Sommet 1 is one such bike. At this price, it’s incredibly good value and in a league of its own.